Transparency Market Research (TMR) has published a new report titled ‘Adhesive Bandages Market - Global Industry Analysis, Size, Share, Growth, Trends, and Forecast, 2018–2026.’ According to the report, the global adhesive bandages market was valued at around US$ 2800 Mn in 2017. It is projected to expand at a CAGR in the range of 3.0% to 3.5% during the forecast period from 2018 to 2026. The adhesive bandages market is likely to expand in the next few years, owing to an increase in the incidence rate of injuries across the globe due to various factors such as sports and work. Moreover, factors such as rise in the geriatric population prone to orthopedic injuries & surgeries and newer product offerings by different players are expected to propel the global adhesive bandages market. 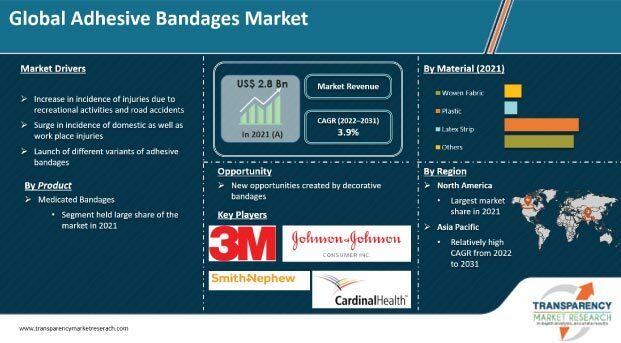 Asia Pacific dominated the global adhesive bandages market and is expected to maintain its position in the coming years, owing to a rise in the injury prone patient pool and increase in the in aging population with higher injury cases. Asia Pacific is a lucrative region of the adhesive bandages market during the forecast period. The market in the region is expected to expand at a CAGR of around 3.5% during the forecast period. A rise in the incidence rate of injuries worldwide among all age groups due to sports, recreational activities, road accidents, and adventure activities is a major driver of the global adhesive bandages market. There is a rise in the prevalence of less severe injuries, which can be cured using adhesive bandages. For instance, as per the National Safety Council, U.S., in 2017, around 7,804,940 injuries due to sports and recreational activities were reported in the emergency departments of U.S. hospital. A rise in the geriatric population globally is also a major concern as older people are more prone for small accidents and injuries due to falls. The frequency of falls increases with age and frailty level. Therefore, a rise in the aging population is expected to boost demand for bandages. As per a United Nations report, there were an estimated 962 million people aged 60 years or above globally, which translates to 13% of the total population. Additionally, a rise in the incidence of domestic & work-related injuries and launch of various new product variants in adhesive bandages are major factors that are anticipated to drive the global adhesive bandages market. The medicated bandages segment is a dominant segment of the adhesive bandages market and is expected to maintain its position. It is projected to account for around 88.0% share of the market by 2026, expanding at a CAGR of around 2.9% to 3.3% during the forecast period. The segment is anticipated to reach a value of US$ 3,350 Mn in 2026. A rise in the incidence rate of injuries globally, increase in the efficacy of medicated bandages for faster healing of wounds, and introduction of new products such as butterfly stitches are projected to propel the segment in the next few years. The flexible fixation bandages sub-segment is likely to be highly lucrative and is expected to expand at a significant CAGR during the forecast period. This is due to the flexibility, durability, and less stickiness of flexible fixation bandages. In terms of material, the plastic segment dominated the global adhesive bandages market and is expected to maintain its position with around 43% market share at the end of 2026. The plastic segment is anticipated to reach a value of US$ 1,640.0 Mn in 2026. It is projected to expand at a CAGR of between 2.9% and 3.3% during the forecast period. The segment is expected to be highly lucrative as plastic bandages offer convenience, innovative options, and lower raw material costs. In terms of indication, the global adhesive bandages market has been segmented into wound management, edema control & pain management, orthopedic support, and others. The wound management segment held a major share of the global market in 2017. It is projected to continue to expand and constitute a prominent share of the market during the forecast period. The wound management segment is projected to hold around 79% market share in 2026. The segment is expected to expand at a higher CAGR of around 2.9% to 3.3%during the forecast period. A rise in the incidence of work-related & sports injuries, increase in the aging population, and better wound infection control for minor injuries through adhesive bandages are some of the major factors fuelling the segment. In terms of distribution channel, the global market has been segmented into hospitals & clinics, retail stores, e-commerce, and others. The hospitals & clinics segment held a major share of the global market in 2017. It is expected to expand during the forecast period, due to a rise in the number of emergency care admissions at hospitals due to injuries and better equipped first aid facilities available at hospitals & clinics. The e-commerce segment is estimated to be highly lucrative. It is expected to expand at a significant CAGR of around 3.0% 3.5% during the forecast period, due to a rise in the preference of people toward online purchases, convenience, and better discount pricing available on e-commerce platforms. In terms of region, the global adhesive bandages market has been segmented into North America, Europe, Asia Pacific, Latin America, and Middle East & Africa. Asia Pacific dominated the global adhesive bandages market, followed by North America in 2017. The market in Asia Pacific is expected to expand at a higher CAGR in the range between 3.0-3.5% during the forecast period of 2018 to 2026. The market in Asia Pacific was valued at US$ 780.0 Mn in 2017. Asia Pacific held a market share of around 27.0%, due to a rise in the patient pool affected by recreational, work-related, and domestic injuries; increase in the geriatric population, and rise in awareness among people about wound infections. The global adhesive bandages market is fragmented and has the presence of a number of players. Key players operating in the global market include Johnson & Johnson Consumer Inc., 3M, Essity Aktiebolag(publ). (BSN Medical), Beiersdorf AG, Smith & Nephew plc, ConvaTec, Inc., Cardinal Health, Medline Industries,Inc., DYNAREX Corporation, and Detectaplast. Johnson & Johnson Consumer Inc. and 3M are market leaders in adhesive bandages. Strategies adopted by key players include more product offerings with high quality such as decorative bandages, better brand image, and market expansion through different platforms such as tie ups with online platforms.